In the previous blog after elaborating on the plethora of knowledge in the ancient Indian Culture, we arrived at the concept of Para Vidya (The Superior Knowledge). The Superior Knowledge is the experiential knowledge of the truth. The ultimate truth of the one and only existence. 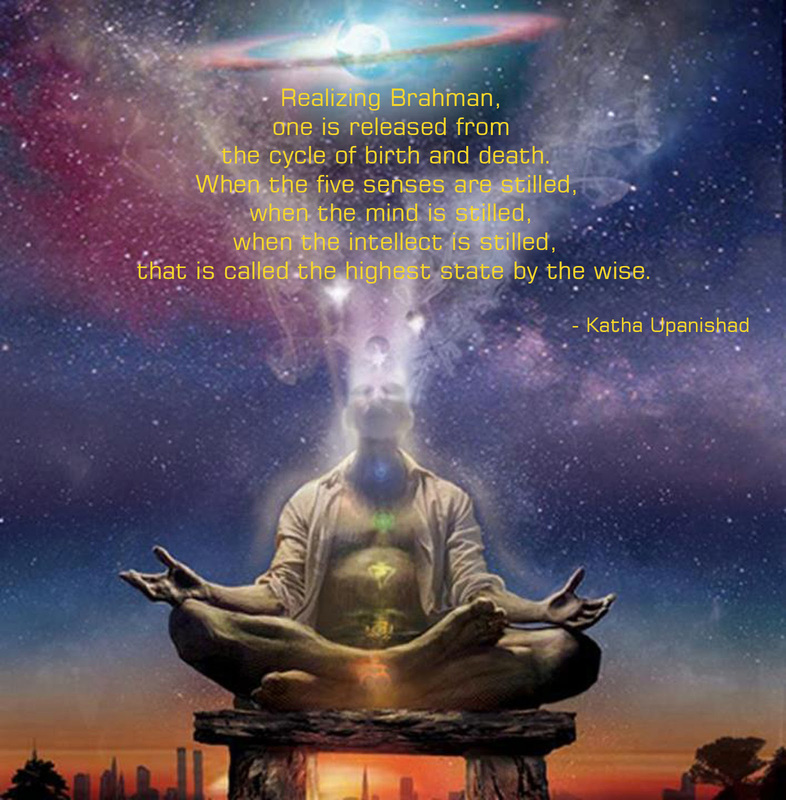 This existence is known as Brahman. As Brahman pervades all things it also exists within us as our own true being. Pure existence is is also pure consciousness. This is the Atman, or higher self, that dwells in the heart of all beings. Brahman and Atman, the absolute and the self are not two. They are two ways of looking at the same reality that is both in the entire universe and in every individual. Great Sage Adi Shankara in his text Vivekachudamani gives a vivid description that can facilitate an understanding on the reality of oneness of Atman and Brahman. “That art Thou“. It is supreme. It is beyond the expression of speech; but it is known by the eye of pure illumination. It is pure, absolute consciousness, the eternal reality. Such is Brahman and “That art Thou“(Tat Tvam Asi). Meditate upon this truth. It is untouched by those six waves- hunger, thirst, grief, delusion, decay and death-which sweep the ocean of worldliness. He who seeks union with it must meditate upon it within the shrine of the heart. It is beyond the grasp of the senses. The intellect cannot understand it. It is out of reach of thought. Such is Brahman, and “That art Thou“. Meditate upon this truth. It is the ground upon which this manifold universe, the creation of ignorance appears to rest. It is its own support. It is neither the gross nor the subtle universe. It is indivisible. It is beyond comparison. Such is Brahman, and “That art Thou“. Meditate upon this truth. It is free from birth, growth, change, decline, sickness and death. It is eternal. It is the cause of the evolution of the universe, its preservation and its dissolution. Such is Brahman, and “That art Thou“. Meditate upon this truth. It knows no differentiation or death. It is calm, like a vast, waveless expanse of water. It is eternally free and indivisible. Such is Brahman, and “That art Thou“. Meditate upon this truth. Though one, it is the cause of the many. It is the one and only cause, no other beside it. It has no cause but itself. It is independent, also, of the law of causation. It stands alone. Such is Brahman, and “That art Thou“. Meditate upon this truth. It is unchangeable, infinite, imperishable. It is beyond Maya and her effects. It is eternal, undying bliss. It is pure. Such is Brahman, and “That art Thou“. Meditate upon this truth. It is that one reality which appears to our ignorance as a manifold universe of names and forms and changes. Like the gold of which many ornaments are made, it remains in itself unchanged. Such is Brahman, and “That art Thou“. Meditate upon this truth. There is nothing beyond it. It is greater than the greatest. It is the innermost self, the ceaseless joy within us. It is absolute existence, knowledge and bliss. It is endless, eternal. Such is Brahman, and “That art Thou“. Meditate upon this truth. Namaste. Thank you for stopping by. Kindest regards.